The ungulates and their relatives are a puzzling group, including animals as diverse as whales and hippos, elephants and hyraxes, horses and tapirs, giraffes and sheep. What they have in common is that many of them walk around on their toenails. The phylogeny (family relationships) of the ungulates is a constantly shifting terrain, but genetic analysis is beginning to help sort out this enigmatic group of animals. At WhoZoo, elephants, hippos and rhinos have been grouped for convenience as "large herbivores," but this is an artifical grouping; these animals actually represent three different branches of hooved animals. The simplified family tree below is redrawn from the cladograms and other information at the University of California Museum of Paleontology Web Site and from an article on mammalian phylogeny in Nature (1 February 2001). 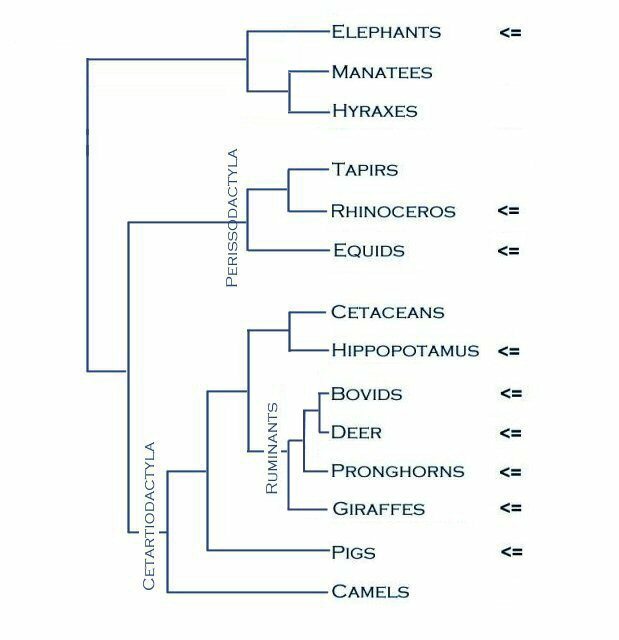 The three main branches of the tree below are the Cetartiodactyla, the Perissodactyla and a part of the recently defined Superorder Afrotheria, which includes the Orders Proboscidea (elephants), Sirenia (manatees and sea cows) and Hyracoidea (hyraxes). In the Perissodactyla, the major axis of the leg lines up with the middle toe (the third digit), while in the hooved members of the Cetartiodactyla, this axis falls between two toes (the third and fourth digits). Because of molecular evidence that indicates similarities between hippos and whales, the Order Cetartiodactyla combines two former orders: the Cetacea (whales and dolphins) and the Artiodactyla. The Ruminants are a large and successful subgroup of the Cetartiodactyla with complex stomachs and the habit of chewing a cud -- a chunk of food that has been swallowed once and then brought back up into the mouth for additional processing. Of the ruminants, the Bovids constitute the largest and most diverse group, including cattle, antelope, sheep and goats. Pointers indicate taxa with representatives at the Fort Worth Zoo. For groups including animals with an informational page or a picture at WhoZoo, there is a link from the group name to one representative of the group. Murphy, et al. Molecular phylogenetics and the origins of placental mammals. Nature 409 (1 February 2001): 614-618.